Move over, Kris Bryant and Joc Pederson: Giants third baseman Matt Duffy is Cliff Corcoran's new leader for this year's NL Rookie of the Year award. A good year for rookies just keeps getting better, with the Cubs’ Kyle Schwarber (.311/.407/.613 with 10 home runs in 140 plate appearances) and the Twins’ Miguel Sano (.285/.394/.555 with nine homers in 165 PA) as the latest top prospects to make a significant impact in the majors. But as productive as those two 22-year-olds have been, neither offers much in the field (Sano is limited to designated hitter duties due to Trevor Plouffe's hold on third base), and neither has accumulated enough playing time to force their way into the lists of the top Rookie of the Year contenders. What you will find below is a new leader in each league, with the AL front runner having opened up a huge lead on his competition and the NL race as tight as it has been all season. Note: All stats are through Wed., Aug. 19. Rookies are players who, prior to the current season, had fewer than 130 at-bats or 50 innings pitched in the majors or spent fewer than 45 days on the active roster prior to rosters expanding on Sept. 1. Based on the raw stats listed here, you might think Duffy should rank behind Kris Bryant on this list, but Duffy's stats are depressed because he plays in an extreme pitchers’ park. Looking at park-adjusted OPS+, the two are in a virtual tie in terms of production (Duffy is at 125 to Bryant’s 128, with 100 being league average). Beyond that, Duffy is a better fielder at the same position and has arguably contributed more with his legs (he has taken the extra base 12 times to Bryant’s nine, reached on an error eight times to Bryant’s four and is five-for-five in stolen base attempts, while Bryant is 12-for-15). Those things are more significant than that three-point gap in OPS+ and make up for the fact that Duffy has made 48 fewer plate appearances on the season, as well. Bryant slumped in late June and July, hitting just .165 over a stretch of 38 games from June 19 to Aug. 1. But that low batting average can be blamed on Bryant's .203 BABIP over that stretch, and he still did all the other things he does well: hitting for power (.196 isolated slugging), drawing walks (one every 7.6 plate appearances), playing a solid third base and swiping the occasional base (five in seven attempts). Since snapping a five-game 0-fer on Aug. 2, his BABIP luck has gone in the other direction, as he's hit .516 on fair balls that stayed in the park over his last 15 games, producing a .358/.460/.623 line over that span with two more steals in as many attempts. That August performance, which includes a 4-for-4 performance with a triple, a homer and a walk Wednesday night, has kept him in a virtual tie with Duffy atop the remarkably deep and competitive NL rookie field. Grichuk leads all rookies with 300 or more plate appearances with a 140 OPS+ and all rookies with 140 or more PA in slugging, adding seven triples and 21 doubles to his 15 homers. However, he has made 160 fewer plate appearances than Bryant and will only fall further behind in playing time now that he’s on the disabled list with a strained ligament in his right elbow. He’s not expected to return until the second week of September at the earliest, which means this will likely be as high as he gets on this list. The last time I did a full look at the Rookie of the Year races was July 9, and Kang had fallen off my list at that point. But from July 10 through Aug. 19, he has hit .328/.401/.566 and taken over shortstop full time in place of the injured Jordy Mercer. Per Ultimate Zone Rating on FanGraphs, which isolates fielding performance at each position, Kang is a sub-par fielder at the more difficult position, but his ability to fill in there when needed and put up huge numbers is more significant. On the season, the gap between Kang’s numbers (including a 121 OPS+) and Duffy’s aren’t that different from the difference between Duffy’s and Bryant’s (Kang trails Duffy by four points in OPS+ and 49 plate appearances), but he lacks the advantages in fielding and base running that lift Duffy over Bryant, and he trails Bryant by 97 PA and seven points of OPS+. Still, with Grichuk hurt, he’s effectively the third man in this race right now. ​Schwarber is hitting .311/.407/.613 through his first 140 major league plate appearances, which is outstanding, but it’s worth remembering that Pederson hit .255/.417/.598 through his first 133 PA this season. That’s why playing time is an important consideration in these races, and it’s never more relevant than in the Rookie of the Year race because of the process of adjustments that rookies go through as the league identifies and attacks their weaknesses. Pederson is a perfect example of that. Earlier this season, he was Schwarber and a highlight-reel centerfielder combined into one, but since the calendar flipped to July, he has hit .157/.303/.276, and the advanced defensive statistics are now unanimous as grading Pederson as below average in center on the season as a whole. Pederson's first three months were strong enough that he’s still holding on to the fifth and final spot here, edging the likes of Schwarber, Phillies third baseman Maikel Franco (a brutal fielder and likely done for the season with a fractured wrist) and partial-season starters Taylor Jungmann and Noah Syndergaard. But with Awards Watch limited to the top three contenders in each race going forward, this could be the last time we see Pederson on this list. With Devon Travis back on the disabled list, Correa, who made his major league debut on June 8, has not only taken the lead in this race but is also running away with it. Delivering on every part of his No. 1 pick potential at the tender age of 20, Correa is third among all major league shortstops in home runs despite starting the season in Double A and is second in Baseball-Reference's WAR (3.2 to Brandon Crawford’s 5.9). 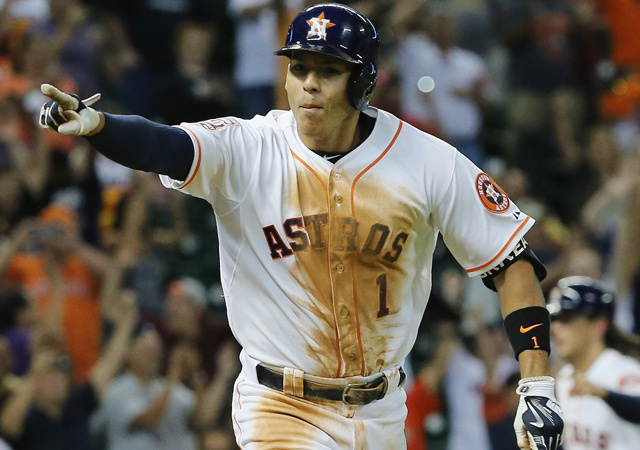 Among major league shortstops with at least 150 plate appearances this season (he has 270), Correa leads in on-base and slugging percentage and OPS+ (144), has ten steals in a mere 12 attempts, and is an excellent fielder to boot. He also appears to be getting better. Correa hit .287/.309/.543 in June, his first month in the majors, then hit .306/.378/.541 in July. Note that huge leap in on-base percentage: He drew just three walks in 97 plate appearances in June, but 10 in 98 PA in July. That’s one walk every 9.8 PA in the latter month, a good rate for a 20-year-old rookie. So what has he done in August? He has walked 13 times in 75 PA, or once every 5.8 plate appearances. He has also posted an isolated slugging of .274 this month; by way of comparison, Giancarlo Stanton’s career ISO is .277. Correa will surely have his share of slumps and adjustments as his career progresses, but his performance to this point has been outstanding, and it may not be too early to put him on the short list of the best young players in the game alongside 23-year-old Mike Trout and 22-year-olds Bryce Harper and Manny Machado. In stark contrast to Correa, the 27-year-old Karns has only been slightly above average on the season, besting the average AL starting pitcher in ERA, ERA+, strikeouts per nine and WHIP, but below average in strikeout-to-walk ratio and innings per start. Still, slightly-above-average starting pitchers are very valuable, and in this year’s underwhelming AL rookie field, that’s enough for a distant second place in this race. Osuna has been far better than slightly above average in relief for the Blue Jays, making the leap from high A to the majors at the age of 20, then pitching his way into the closer’s role by midseason and going a perfect 14-for-14 in save chances since, tossing more than a single inning in four of those saves. Still, I’ll take Karns’s slightly-above-average performance in 136 innings over Osuna’s dominant one in a mere 54 2/3 frames. Travis hit .357/.402/.488 in between his two disabled list stints for a strained left shoulder, proving his hot start was not a fluke. However, because off the injury, he has now made 31 fewer plate appearances than Correa, and there is no timetable for his return. Burns is little more than a league-average centerfielder, but that has value, and he has provided that value for the A’s since May 2. Despite spending April in the minors, Burns leads AL rookies in games (by five over Steven Souza Jr.) and plate appearances (by 66 over Souza). That combination of competence and attendance gives him the edge over small sample successes such as the Angels' Andrew Heaney (5–1, 2.43 ERA in 10 starts) and Sano.